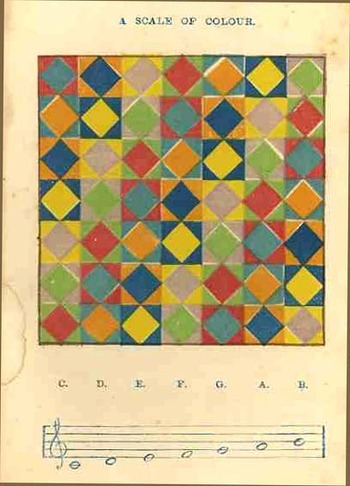 JF Ptak Science Books: Color Music--Found Images and the Second Perfect Number. 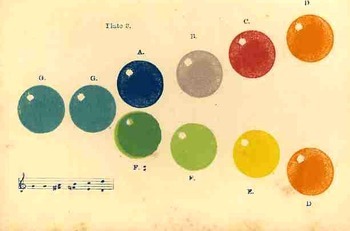 Color Music--Found Images and the Second Perfect Number. Bach, Wagner and Dvorak. Experimentation of a new order took place in the early 20th century in the hands of Scriabin (who thought colors were associated with tonality, not with singular notes), Kandinsky, Schoenberg and Marc. C: red, blue, orange, blue, yellow, violet and green. E: yellow, violet, green, red, indigo, orange, blue. F: green, red, indigo, orange, blue, yellow, violet. And so on through the scales of G, A and B. When you assign numerical values to each one of these colors (green=1, red 2, indigo=3, violet=4, red=5, green=6, yellow=7), the sum is 28.
second perfect number (following the first perfect number which is 6)—a perfect number being the sum of its divisors, including unity but excluding itself (so 28= 1+2+4+7+14). 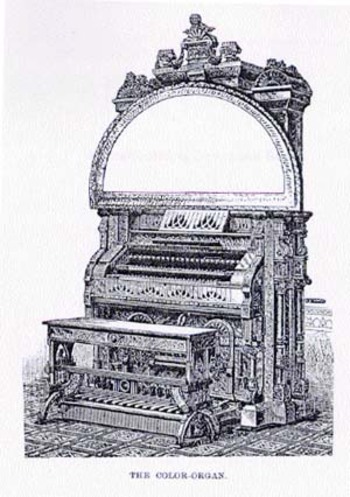 The following chart is from the wonderful color/music siteVISUAL MUSIC.